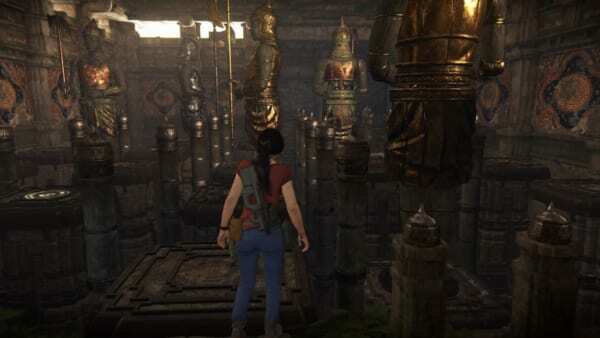 This article contains the main walkthrough for Chapter 4 – The Western Ghats in Uncharted: The Lost Legacy along with the weapons and tips. 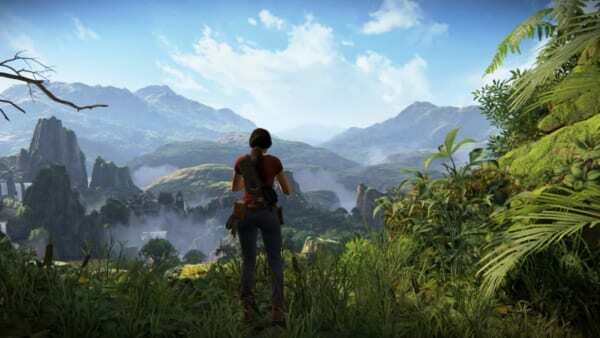 In Chapter 4 – The Western Ghats, the players will encounter multiple enemies, puzzles, and weapons. These puzzles often times involve climbing, swimming or, sneaking around. 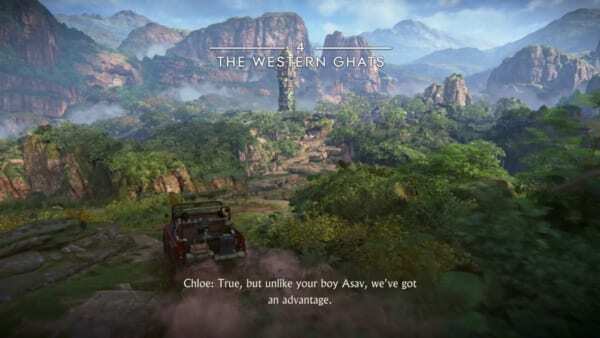 The Western Ghats area is quite large which requires the players to drive around a bit in order to get to the fortresses. After the game tells you how to look at the map, head towards the tower. If you get lost, look at the map to check your current position. When you reaches the tower, start climbing the tower. You will need to use the rope to climb up. At the top of the tower, there is a room with four doors. Open all doors and a lever will appear in the middle the room. The map will also be updated. Activate the lever and it’ll bring the player down to the entrance of the tower. You will have to go to all three fortress to proceed further. Upon reaching the fortress, use the winch on the car similar to how you used it in Chapter 3 to pull down the gate. After making your way the gate, head right and jump onto the ledge. Climb up the ledge. Be wary of the two enemies waiting on top of the ledge. You will only be able to use your sidearm while hanging on the ledge. After you make it up the first ledge, jump on to the next ledge. There will be a enemy peeking from above, and in order to climb up you will have to continuously shoot the enemy as he doesn’t die from a head shot. After you make it to the top, another enemy will appear. Jump down onto the right ledge, then use the rope to grab the ledge located on the left side of the cliff, then climb up. Proceed further and you will reach a area with multiple soldiers on guard. Hold L2 and press L3 to mark the soldiers to make it easier to check their position. Use the rope to jump on the left cliff. After you do so, make use of the tall grasses and ledges to take out to stealth kill the enemy. However, the player can also choose to shoot them out. Make your way through the enemy until and head for the giant gear. Use the giant gear to open the gate. After you make it through the gate, you will have to cross the bridge, but it will collapse due to Nadine being too excited. Make your way around the cliff to join Nadine. Climb up the stairs and you will find a puzzle at the top. Spin the puzzle and make it into a shape of a bow (See the picture below). After completing the puzzle a lever will appear. Spin the lever with Nadine and water will come out from the fortress. Also, the map will be updated. Follow Nadine to get back to the car. Similar to the Bow Fortress, use the winch to open the gate. Nadine will drive the car for you. Enter the gate, and make your way up the stairs and jump onto the ledge straight ahead. You will fall down into the pond below. Swim forward then left to find an hole underwater. Swim through the hole until you reach an open area. Look for a cliff with a piton jabbed into it. Climb up the cliff using the piton. Follow the pathway until there’s another patch of water. Unfortunately, there are soldiers guarding the area, and you will have to take them out to proceed. Spotting the enemy will make it much easier to defeat the enemies, and bullets will not hit you if you dive underwater. Once you’re done dealing with the soldiers, go ashore and climb up the wall. Proceed forward and you will reach come across rooms with statues holding an dane axe. Pull the lever and stand on the floating platform to activate the gimmick. Forward, Right, Left, Forward, Left, Forward, Left, Forward, Right, Forward, Forward. Forward, Forward, Right, Left, Right, Right, Forward, Right, Forward, Right, Forward, Left, Right, Left, Left, Forward, Forward, Forward, Forward. Once you make it through the third room, head outside and up the stairs. You will find the same type of puzzle saw earlier at the Bow Fortress but this time, spin the puzzle and make a shape of an axe. After completing the puzzle a lever will appear. Spin the lever with Nadine and water will come out from the fortress. Also, the map will be updated. Using the rope and piton, follow Nadine to get back to the car. The gate for this fortress is already open, so you will not have to use the winch. This area is filled with soldiers on guard, and best way to pass through this area is to take out the enemies one by one. Look around your surroundings for a weapon crate as it contains useful long-range rifles. After taking out the soldiers, check the closed door. To open the gate, you must find five wheels in order to open the gate. Wheel 1: Head out to the entrance and you’ll find it on the ground. Wheel 2: From the gate, walk along the cliff on the left and you will find the second wheel placed on the side of a stone structure. Wheel 3: From the second wheel, walk along the river until you reach a waterfall. From the waterfall, turn right and walk along the cliff until you reach a ledge which you can climb. Look behind you for the third wheel. 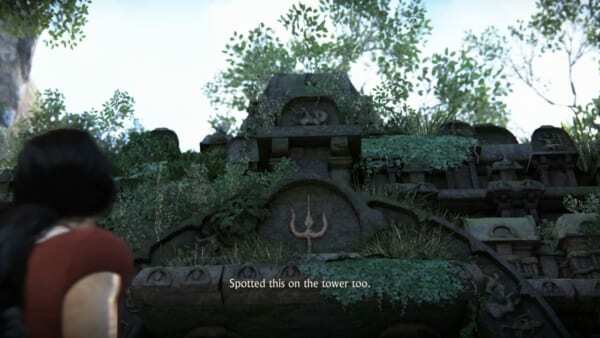 Wheel 4: Go up the ledge you found previously, and follow the path until you reach the second tower. Climb up the step and you will find the fourth wheel. Wheel 5: From the gate, head out. Go down the second stair and take a immediate right. Walk forward and go up the stairs to your left. Walk along the path to find the last wheel. After finding all the wheels, head back to the locked gate. The door will open and reveal the last puzzle. Spin the puzzle to make a shape of a Trident. Spin the lever with Nadine and water will come out from the fortress. Also, the map will be updated. You will have to make your way back to the car, but there will be enemies blocking your way. After you enter your car, head to the Ganesha fortress located at the Northwest direction. Spin the lever with Nadine to unlock the gate. Enter the gate to reach Halebidu.